I attended my first ever yoga class, and it was harder than expected. My main difficulty was with the breathing. Whenever the instructor told my to breath in my lungs wanted to breath out, and vice versa. It was always back to front. The instructors breathing instructions were also extremely slow. Was I meant to hold my breathe that long and risk passing out in front of a class of people I did not know? (My location was conveniently at the front of the class so I could easily see the instructor and the class could see me). Was I meant to have multiple breathes timed perfectly with when the instructor would randomly voice the next direction? By the time I had got my breathing back in sync with one exercise another one had started and the challenge of timed inhaling/exhaling would begin all over again. As part of the warm up/relaxation there was an emphasis on breathing deeply…concentrating the breathe into different spaces. Maybe I was misinformed during secondary school biology and numerous first aid resuscitation courses but I thought that air could go into one of two places – the lungs or the stomach (ok 3 spaces if you want to count each lung separately). We started by breathing into the stomach. Easy. Then into the lungs. Fine. The problems started when the instructor wanted to isolate different areas of the lungs (and not left then right). First it was the bottom of the lungs – the area closest to the stomach. Then the top of the lungs followed by the back (towards the spine) and the front of the lungs. Lungs are like a balloon that just fill with area...in all areas…and just expand as they become more filled. There is no segmenting off the balloon, except for those used for balloon animals. My lungs are not a lycra giraffe, and I am pleased to say that after this yoga experience they still aren’t. 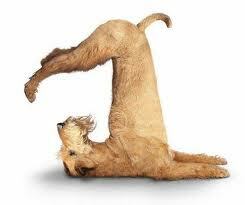 I also found some of the exercises intuitively back to front, for example the downward dog. There is nothing “down” about it. Arses are pointed well and truly up. To be honest there was nothing war-like about the warrior pose either. The dress code was comfortable, non-restricting clothes. No-one mentioned the removal of shoes and socks! This does however go a long way to explain the incense. The challenge in choosing the most appropriate clothing is difficult. Loose is good but too loose can be visually awkward for the rest of the class. Actually, tight stretchy clothing can be equally off putting for fellow yogis*. In all fairness there is no clothing ever made that will make poses like the “king pigeon”, “cow”, “cobra” or the “camel” flattering for anyone. I am not going to even get started with the “wide-legged forward bend. I am pleased to say that I had the strength, balance and control to complete all of the poses albeit with not the same fluidity or flexibility of the instructor. The class ended with the ringing of the bowl/bell. At this stage our eyes were closed as instructed, the windows had been closed having finally aired the room of the mixed aroma of feet and incense and then suddenly a bell, it was like being woken up by a door bell. It is not relaxing at all. Instead it instills a slight sense of panic. What am I wearing, do I have bed head, did I drawl while sleeping and if so is it now drying on my chin? And yes these thoughts did all pass fleetingly through my mind. Thankfully the instructor did not ask if I wanted to change my electricity provider or to join her religion. Now I am off to see if I can create a downward dog with my lungs, ready for the next class. *The instructor, with all of her innocent enthusiasm somewhat patronizingly called all of the attendees in the class “yogis” Did that make her Boo Boo or Park Ranger Smith? Either way I was disappointed that there was not picnic basket.